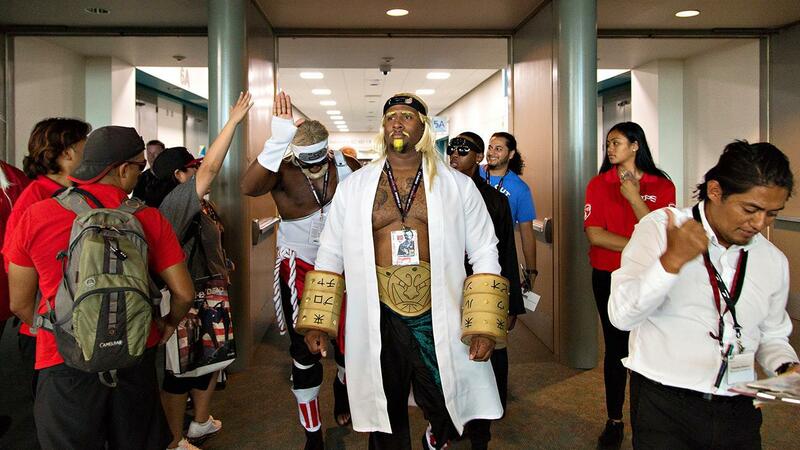 Green Bay's Mike Daniels, a human-wrecking ball and lifelong anime fan, finally got a chance to go to Comic-Con. And the 300-lb. defensive tackle couldn't pass up the chance to cosplay as one of his favorite characters. For one day at the jam-packed San Diego Comic-Con, the Packers' menacing interior lineman transformed into Raikage, a powerful village leader from the Japanese animation series Naruto. The Green Bay Packers' defensive lineman has spent two decades obsessing over Japanese animation, otherwise known as anime, and now he has finally reached the mecca. It's Comic-Con 2017, where more than 100,000 die-hard fans of everything from gaming to comics to anime gather annually to live out the childhood fixations they never grew out of. Daniels is here for the very first time and in cosplay, dressed as Raikage, a central character for the anime series Naruto. "This kind of stuff, it wasn't the cool thing when I was growing up," Daniels said at the start of his four-day adventure through Comic-Con last week. "Now, pop culture is comic books, super-hero movies, anime, manga, and I've been doing it for a long time." It's a Thursday afternoon in San Diego's Gaslamp District, on the eighth floor of the Hard Rock Hotel, across the street from the convention center that will house Comic-Con and all of its bedlam. Packers defensive lineman Mike Daniels (front), who loves watching anime every bit as much as he loves sacking quarterbacks, can't stop smiling. He's with his brother, Sean, and four of his closest friends, getting ready to cosplay and spiritedly debating the nuances for one of his favorite series, Naruto. The room grows increasingly louder, busier. Daniels turns to his publicist -- generally oblivious to this world -- and encourages her to corral an entire group to dress as Sailor Moon next year. All he gets is a playful nod. Suddenly there's silence, and Daniels cuts through it. "Yo," he says, "shout-out to Cartoon Network for bringing the greatest anime!" It all started with the Pokémon craze of the late 1990s, for which Daniels was a target consumer. From there it was Sailor Moon, a series he began to watch because of his sister. "Then I saw Dragon Ball," Daniels said, "and it changed my life." Daniels was in fourth grade. The animation blew him away at first, and to this day the storytelling enthralls him. Daniels still loves the Dragon Ball franchise, but he's also drawn to Hunter X Hunter, Attack on Titan and Tokyo Ghoul, among others. On this day, though, it's all about Naruto, which follows an adolescent ninja through his quest to become the leader of his village. Daniels spent $3,000 on his costume. He's dressing as Raikage, a village leader in his own right. It's his first time in cosplay. Long overdue. "This is lit, ain't it?" Daniels says at one point, to nobody in particular. Daniels has been talking about coming to Comic-Con since he was drafted. That was five years ago. Sometimes training camp got in the way, but really, Daniels hadn't attained the notoriety to establish the connections required to get him out here. Now he has. Daniels has racked up 20 sacks over the past four years, seemingly getting better with each passing season. He is becoming something of a household name, which is why he was able to make this a boys' trip, just like he always wanted. When the blond wig comes on, the laughs erupt. Some tell him he looks like his teammate, Clay Matthews. Others proclaim him The Black Fabio. Daniels chuckles. "This is a dream come true for him," says his manager, Michael Saenz. Saenz (middle) doubles as Daniels' childhood friend. They met on a basketball court in Blackwood, New Jersey, and played on the same defensive line in high school. Saenz's teenage years were comprised largely of late nights at Daniels' house, rewatching Dragon Ball Z episodes until the wee morning hours. Now they continue the tradition with their kids through FaceTime. They recently started having them watch the Japanese versions with the English subtitles as a way to sharpen their reading abilities. Saenz will freely admit that he isn't on Daniels' level of anime knowledge. "I can have any conversation when it comes to anime with any average fan, even with the people who are not your average fan," he said. "This guy right here can go and have conversations with the creators." Sean Daniels is a football player, too. He's a defensive lineman for the Philadelphia Soul of the Arena Football League, and he's nearly as big a fan of anime as his older brother. For Comic-Con, he dressed as Killer B, Raikage's younger brother in the fictional world. His smartphone will tell you that loving anime and playing professional football isn't all that rare. "There's a lot of guys out there that love what we love," Sean said. "I have teammates, my brother has teammates, that absolutely love this stuff. They may not want to come out and dress into cosplay as we are right now, but they love staying home, watching things. I'm Snapchatting things, and all my friends are hitting me up, teammates are hitting me up, like, 'Man, you could've sent an invite; you could've let me know.'" There's a deeper meaning to all this for Daniels, because he wants to teach children the value of staying true to who they are. When he hosts camps, Daniels typically has a central message for the kids: Go after what you love, no matter what that is. Growing up, loving anime meant being labeled as a "nerd" or a "dork" or a "geek," but Daniels never cared. "You're not going to change me," he said. "I love being me." He wants the next generation to feel the same way. His college friend, Terrance Pryor, put it this way: "What he's doing is letting young people who may be a little self-conscious about their passion for anime know, 'Hey, just because you like this doesn't mean you're less than anybody or weaker than anybody. You can be one of the strongest and still have a passion for it.'" Daniels and his crew are here for four days, and the schedule is packed. Their first stop, at 1 p.m., is a Nintendo convention on the ground floor of the Hard Rock Hotel, where they'll take part in a photo shoot and play video games like Mario Kart and Pokkén Tournament DX. From there, they're off to a meet-and-greet at a nearby bar called Whiskey Girl at 2, then a VIZ Media panel discussion at 4. Nathaniel Johnson (left) has known Daniels since the seventh grade and is dressed as a member of the Akatsuki, an organization of criminal ninja in the Naruto series. More specifically: Johnson is here for Raikage and Killer B to fake sever his head with one of their signature moves, the Lightning Release: Double Lariat. They'll do that a lot. Sean is 2½ years younger than Daniels, so he basically grew up in a world of anime. "I had no choice but to get into it," he said. Sean began with Dragon Ball Z, which sent him down the anime rabbit hole and also spawned his love for comic books. "I love that I'm so diverse that I can go have a conversation with anybody," Sean said. "If you want to classify someone as a geek and say they're the kind of person who stays in the house and plays video games all day, I love that I can have the same conversation with them that I can have with a person on my team who plays football. I love that my brother and I are so diverse we can do that." But it isn't even about that. Sean believes he and his brother are, in some way, breaking down stereotypes. "If there's people who want to have that wall up, well just know that my brother and I, we're breaking that wall down," Sean added. "The jocks are the nerds; the nerds are the jocks. There's no such thing as an individual one thing anymore. We're all integrated." Comic-Con included a midday wardrobe change for Daniels. The Whiskey Girl event revolved around Dragon Ball, so he slipped on one of his many appropriate tank tops. Daniels spends somewhere in the neighborhood of $500 on anime-related paraphernalia each month, on anything from action figures to clothes to Blu-ray discs to manga (comics). Daniels made anime small talk with every fan that came through. One approached him sporting two familiar blue antennas on his head. Daniels beamed: "Tick!" Later, an on-camera reporter asks Daniels about the Dragon Ball franchise. "It's not just a show," he says, solemnly. "It's a way of life." Back into costume. Daniels walks out of the hotel room, and suddenly he's back into character. He leans up against the wall, balls his hands into fists, flexes his arms out in front of his torso and lowers his chin ever so slightly. "I am the Raikage from Naruto, the leader of the Cloud Village," Daniels -- or, Raikage -- explains in a deep voice. "He specializes in thunder techniques. He's a no-nonsense kind of guy, always for the betterment of the village, and his favorite move is straight-up beating the crap out of you. Him and I have a lot in common." Daniels never breaks character as he strolls the halls of the San Diego Convention Center, chest out, face stern. Pryor can't help but laugh as he walks behind him. "Look at him," he says. "He really thinks he's Raikage." Daniels' Raikage character lost an arm-wrestling competition with Lady Tsunade, worn by Charlene Ingram (left) because, well, that's how it goes in Naruto. Daniels is the center of attention in conference room 4A, filled to the brim with anime fans, most of whom are not as knowledgeable as Daniels himself. Daniels stumps the room with an esoteric question related to the amount of English voiceovers for a specific character, and soon they all understand: Daniels isn't just a fan, he's a savant. He's fascinated by the anime concepts and quick to break down every last detail. Daniels estimates owning nearly 1,000 DVDs and VHS copies of anime series, 70 percent of which are Japanese. He's learning the language through Rosetta Stone so he can take his consumption to a whole new level. Now that's commitment. Almost everybody who walks by Mike and Sean Daniels at the exhibit hall stops to snap a picture. Nobody has any idea that they're professional football players, they just love their costumes. Some even stick around long enough to act out some anime fight scenes. "I don't know who they are," one friend told another at one point, "but they're incredible." Daniels draws inspiration from anime on the football field. Seriously. His biggest motivation comes from Dragon Ball. "The characters," he explained, "they're literally training for their lives. They're training, they're pushing themselves. The whole purpose of their training is to push themselves to a level higher than they've ever been, surpassing where they have their ceiling. As a professional athlete, you're seeking to do the same thing." The main character from the Dragon Ball franchise is Goku, who hails from an extraterrestrial warrior race and dedicates his life to protecting his adopted planet, Earth. So, is Daniels the Goku of football? "He thinks he's the Goku of football," Pryor said. "He's not quite there yet." Daniels felt lonely in his love for anime throughout high school, but it stopped in college. About five of his Iowa teammates shared the same passion, Pryor included. It continues in the Packers' locker room with Nick Perry, Chris Banjo and newcomer Martellus Bennett. Even Cowboys star Dez Bryant is into it. Joining the Daniels brothers and Johnson in this photo are Mikal Mosley (right) and Kate Alford (middle), who helped dress them into their costumes. Daniels hopes to find more NFL players they can outfit. "You do have to kind of feel around for it, but some guys are a little more open about it than others," Daniels said. "Once it's out there, it's out there, and you're brothers for life. We're going to see movies together, we're going to conventions together, we're doing all that stuff together. That's what it's all about, man."